Envelope Printing -- innovation remembered! I just read an interesting note from Chris Shipley today regarding the history of the Demo conference, one of my favorites. She points to the beginnings of Demo and the role envelope printing played in its first year! Much of technology innovation comes feature by feature, and it always has. The very first DEMO conference nearly 17 years ago, included a little “feature company” that made envelope printing a breeze. Until then, trying to get four address lines properly placed on a standard envelope was a nightmare of waste and frustration. This feature spurred Microsoft to make it a cornerstone of the next release of Word. Here it is, straight from my local Dollar Tree. Not that I was shopping for one but my HP PSC 1210 has been given me warnings about an empty cartridge so I decided why not give it a try! More in a few days (or weeks, or months? ), when the cartridge really runs out. Today, Lexmark (NYSE LXK) announced increased earnings and (slightly) increased overall revenues (+1.6%) for their Fiscal 3rd Quarter. The details included interesting but not surprising mix change, with business segment sales up 8% and consumer revenues down 5%. 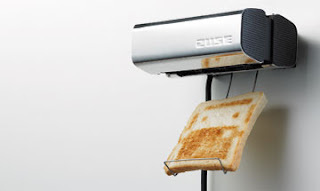 The company cited Q4 revenue prospects as flat to down in the "low-single digit percentage range" despite a new and ongoing TV advertising campaign, an SMB initiative, and new color and mono laser printer products announced yesterday. Wall Street responded in the negative, with shares down about 5%, or just under $60/share, near the close of Tuesday trading. 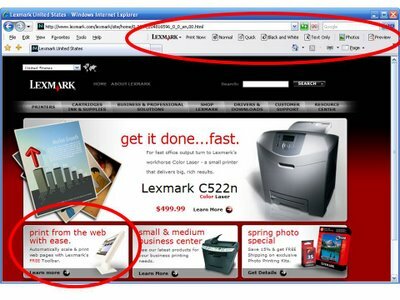 Glad to see that my update from the IE7 beta to released included the previously installed Lexmark Print Bar. Now how the functions interact, with their seemingly overlapping print enhancements, is still an open question -- worth looking into? 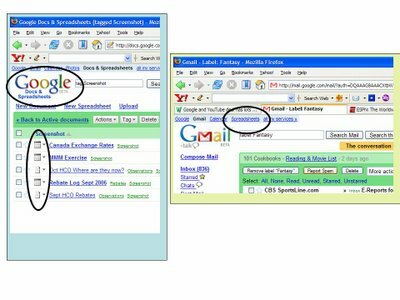 Microsoft officially announced Internet Explorer 7.0 today. I won't summarize the new features, market situation or history of Web browsers, as others have already done a great job with that. But I will point out that one of the biggest improvements in IE 7 compared to its predessors is enhanced printing! As a pretty much full-time Firefox devotee, I don't use IE very often, but I have been using the Beta of Version 7, intermittently anyway. And the printing is much better. And as a matter of fact, Microsoft's spokesperson says, "the most popular feature among beta testers has been improved printing of Web pages". Hey hey -- how about that! Interesting that enhanced or improved printing really just means that pages come out of your printer they way you'd expect them to! Here's another news item that surfaced after returning from my vacation. Industry analyst firm InfoTrends (aka CAP Ventures) has been acquired by Questex. Observations: Where Are They Now? Taking a cue from the mainstream media that caters to the public’s insatiable interest in child television stars and has-been musicians, Jim Lyons takes a walk down memory lane in the printing and imaging industry. No stranger to the spotlight himself, Lyons shines a light on key technologies and executives to reveal how the industry’s cast of characters has helped define the printing and imaging industry. One of the inspirations for this month’s column was the recent news that Monotype acquired Linotype (Observer, 9/06). Both of these companies are legendary names from the printer industry’s early days, when fonts were a really big deal and the desktop publishing (DTP) movement was white hot, forcing the printing industry to learn far more about typography than TmsRmn and Helv (the font names of the LaserJet’s first proportional typefaces). At the time, the ability of PostScript-based DTP programs to send output directly to “Lino” typesetters seemed magical—although how many users actually did so is another question. Bob Givens, president and CEO of Monotype Imaging, served as company spokesperson in last month’s Observer story on the acquisition. Givens first appeared in the pages of The Hard Copy Observer in October 1994, commenting on Agfa’s Universal Font Scaling Technology (UFST), which was a progeny of Intellifont, a technology that Givens helped develop in the years preceding The Hard Copy Observer’s inaugural issue. At the time, Givens was vice president of Agfa’s Typographic Systems, which had morphed through ownership and name changes from Compugraphic, and UFST was discussed at that summer’s San Francisco Seybold Conference. The Observer’s article on Seybold San Francisco 1994 discussed Infinifont technology. Although that font technology appeared to be gaining momentum and was embraced by HP and other vendors, today Infinifont is obsolete and has been replaced by UFST from Monotype Imaging, née Agfa Monotype, née Agfa Compugraphic. (Thanks to a fellow industry veteran for clarifying this history.) Remarkably, Bob Givens still captains the ship. My initial column on Microsoft’s XML Paper Specification (XPS) was also rather nostalgic (Observer, 4/06), delving back to the 1980s, and the column generated an interesting response from a colleague at QualityLogic, one of the small but important firms making up the XPS ecosystem supporting Microsoft’s moves in this area. Dave Jollata, QualityLogic’s chief operating officer, noted, “When Microsoft acquired TrueImage from Bauer, they [Microsoft] approached us to take over Bauer’s application test files (which we did). That spawned an entire product line for us that is still alive and well today … [QualityLogic] also just added a former Bauer guy to our board—Steve Butterfield. [It’s a] small world.” As a refresher, Bauer and TrueImage were in the middle of the Microsoft, Apple, and Adobe printer language battles of the late 1980s. Moving more into the hardware realm, a contingent of longtime HP executives now lead a number of other printing and imaging firms. For example, Kodak employs several former HP alumni, including Antonio Perez, CEO of Kodak, and Jim Langley, president of Kodak’s Graphic Communications Group (GCG). Other examples of former HP executives who now work for other printer OEMs include Steve Fletcher, president and COO of Konica Minolta Printing Solutions, which incorporates the QMS legacy and Minolta’s subsequent acquisition, and Bill Rumold, CEO of TallyGenicom, a company whose name is a combination of venerable printer industry names. Former HP employees also continue to influence the imaging and printing industry in other ways. One notable exception is Wall Street analyst Cindy Shaw, who has HP and Dell work experience on her resume. Shaw is a regular (and favorite) on the Wall Street panel at the annual Lyra Imaging Symposium and is often quoted in the Wall Street Journal and seen on CNBC. This partial listing may be the result of HP bias on my part, but it is not surprising that the longtime industry leader would develop so much technical and management talent and then see that talent disperse throughout the industry. But how about people joining HP? CEO Mark Hurd has been praised for hiring top external talent, but that trend has mostly been on the PC side of the business. However, earlier this year, Bruce Dahlgren, senior vice president of worldwide enterprise sales for HP’s Imaging and Printing Group (IPG), was hired away from Lexmark, but that defection was not without controversy. Lexmark challenged HP’s hiring of Dahlgren in the Kentucky courts, which put Dahlgren’s position at HP in limbo and prevented him from talking with industry analysts at HP’s analyst event in June. While these events seemed controversial at the time, they now pale in comparison to the headlines surrounding HP’s tactics in investigating members of its board as sources of possible leaks. As the final part of my “Where are they now?” column, let’s briefly look at the flip side: who has not moved on? I mentioned Bob Givens’s staying power earlier, but a couple of well-known HP names also come to mind. As I have noted in this column previously, Vyomesh “VJ” Joshi, currently leader of HP’s IPG, has served HP in a variety of positions and has been quoted in the pages of The Hard Copy Observer since nearly its beginning. Cathy Lyons (a longtime HP colleague but no relation) first appeared in the second issue of The Hard Copy Observer, touting HP’s new LaserJet IIP Plus (Observer, 11/91). After achieving great success in a variety of roles, Lyons has become HP’s chief marketing officer (CMO), a position she has held for a little over a year. These long-timers prove the exception to Hurd’s practice of importing his top management talent. These industry names are just the tip of the proverbial iceberg. In an industry with no shortage of interesting players, there is more than enough information to make “Where are they now?” a recurring topic explored in this column. Message to readers: I’ll need your help! With enterprise customers as the focus of the launch, the headliner is the new inkjet technology HP has branded "Edgeline". Read HP's materials and catch all the analysis in next month's Hard Copy Observer. As a beta tester of both of the separate products (or are they services? ), I noticed the change last night, but today, Oct 11th, is the official launch, timed with the Office 2.0 conference in San Francisco. Neither product matches the scope of Microsoft's Word and Excel, but that's kind of the point. I found that for simple documents and spreadsheets they're pretty nice, and of course having your files stored remotely means they're accessible from whatever computer you find yourself using. The collaborative features mean work teams can have access to and modify files, and the link to Gmail (my email client of choice) is just one more little nicety -- though notice on the right-hand screen shot they still have the label "spreadsheets" that links to the combined site. One loss in all this? Looks like the Writely name is gone -- which I liked. A survivor of the dot-com boom and bust, NewspaperDirect continues on with their original value proposition of providing print-on-demand newspapers in locations where traditional physical distribution can't reach. With lots of breaking news going on while cruising the last few weeks (an Atlantic crossing no less), I was able to get a USAToday printed on board thanks to this company's offering. 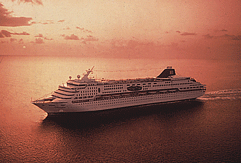 A little pricey ($3.95 a day) but what do you expect on a cruise? That's the opening line of Business Week's Technology column for September 12th, entitled "USB: Wayward Gadgets Find a Port". It's a fun piece, by Joseph Pisani, about various toys and gadgets on the market that use the PC's USB port for power. And as a printer guy, always nice to see a little pub for our product category! Here's the chart from The Hard Copy Observer September 2006 Observations. BTW "Data...has been annualized" (sic) is the editor's addition! Observations: The Tipping Point for Rebates? Who among us has not been lured by a rebate—that age-old offer to save money either instantly or after mailing in a few “simple” forms? This type of promotion has been a mainstay in many consumer markets, including the printing and imaging industry. This month, Jim Lyons, a 20-year veteran of the printing and imaging industry, leads us through the rebate maze and shows us what may be at the other end. Reading the business press lately, or even skimming the Sunday newspaper, one could easily conclude that the demise of the mail-in rebate is at hand. Computer and printer supplier Dell and big-box retailer OfficeMax have been vocal about joining the rebate-ending bandwagon in recent months, following in the footsteps of rebate reformers Staples and Best Buy. Most of these companies are not immediately terminating the use of rebates (OfficeMax being the exception) but are simplifying or phasing them out over time. But are these computer and printer sellers just delaying the inevitable? The time that these retailers must spend to root rebates out of their systems demonstrates how ingrained rebates have become as a merchandising tool for selling their wares. Some observers have described this movement as consumer power at its best, with consumers expunging from the market one of their biggest complaints about buying at retail. But is this assessment accurate? Mail-in rebates (MIRs) have long been an important part of the printing and imaging business, enabling vendors to break through long-standing price barriers to offer products such as the “first sub-$100 monochrome laser printer” and the “first sub-$500 color laser printer.” Buy.com recently offered a $50 MIR on the Samsung ML-2010 to break the $40 price barrier. While this price barrier was not one that industry participants had long been striving to best, offering a monochrome laser for less than $40 is still a jaw-dropping feat. (As I write this column, Staples is again offering the Samsung CLP-510 color laser at a rebate-fueled $199.99.) Beyond their value in helping vendors to break through symbolic price barriers, rebates have also helped vendors to prosper by enabling them to move older inventory to make way for new product lines and by increasing the installed base of devices that use imaging supplies. When did rebates begin in our business? Their presence was noted in the very first edition of The Hard Copy Observer from October 1991, which contains several references to rebate promotions on products such as Apple LaserWriter printers, GCC BLP and PLP printers, and the NEC SilentWriter printer. 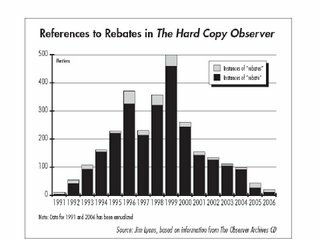 A simple text search of the Hard Copy Observer Archives shows that, by 1993, every issue contained multiple references to rebates. 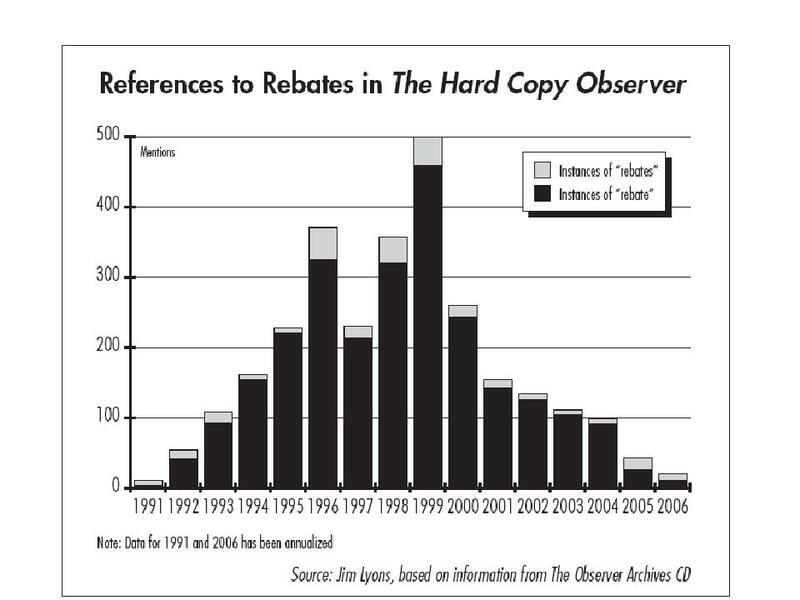 The chart above is a quantitative study of references to the terms rebate and rebates in the Observer, and rarely does a study yield such a definitively shaped curve. The number of instances of these terms in the Observer peaked at an even 500 in 1999 and has been declining every year since. One explanation for the downward trend is an underlying change in how The Hard Copy Observer reports on the industry, and in fact, a major editorial section that closely followed retail pricing and accounted for many of the references to rebates began in 1995 and was discontinued in 2003. I’m not advancing causal relationships here—after all, this is not Freakonomics. Nevertheless, the data shown in the chart speaks for itself and certainly surprised me! While nothing is set in stone, it does indeed seem that rebates will continue to diminish in importance in the printing and imaging industry. I plan to revisit this topic in a future column to review the accuracy of this prediction. How about rebates in general? With “rebate abatement” in the news, are rebates really on their way out? What I consider the definitive article on rebates, entitled “The Great Rebate Runaround, ”appeared in the December 5, 2005, issue of Business Week. In the article, lead writer Brian Grow details widespread customer frustration and the inner workings of the rebate game, including the profit-building “breakage” and “slippage” factors. These innocent-sounding terms refer to the percentage of buyers who never complete their MIR applications and the percentage of buyers who do fill in the applications but fail to cash their rebate checks. In an e-mailed response to questions for this article, Grow acknowledged that while the rebate process is changing, it will never go away altogether. And that, I must confess, is good news to me. As a gadget lover and bargain hunter, I like rebates. I conscientiously follow the rebate fan’s best practices—be organized, send the rebates in the same day you make the purchase, fill in the forms legibly, and follow up if needed. And most of all, I just love scanning all those receipts into my personal document-management system, and then watching those neatly printed envelopes chugging out of my HP LaserJet printer! Google has enhanced their online book initiative, just in time for the school year! It was June 9th, 2006 when I blogged about HP's stock (NYSE HPQ) trading below $30 a share. It went on to close at $29.94 that day, and didn't get back up above $30 for a close until June 14th. I was remarking about how quietly this plunge from May's highs in the mid-$33's had happened -- but of course the backdrop of June's sketchy general market activity probably had a lot to do with this. Well, markets have improved a lot since then, with even oil going down recently, HP hit good quarterly numbers again a couple of weeks ago, and the stock closed for the first time in YEARS at $36 or above ($36.00 even in this case). Speaking of HP's quarterly numbers, the printing and imaging highlights were typical -- improving margins on good growth in supplies, AIO's and color lasers, and digital presses. In early July, I blogged about some interesting market data I'd gleaned from Amazon's web site, specifically regarding HP's (NYSE HPQ) interesting photo-oriented Color LaserJet 2605DN. Well, I meandered back to the 2605DN's Amazon listing today, about seven weeks later, and found some fascinating changes. The printer's Electronics Sales Rank has shot up to #5,995 -- that's up from rankings around 40,000 when I checked it several times in early July. And the percentages for "What do customers ultimately buy..." alternatives have move a bit -- actually more customers are buying the HP Color LaserJet 2600N now (78% vs 73%) but more are buying the subject printer too (8% vs 4%). The 2605DN's price has been reduced to $449.99 from $471.42 (strange price huh? ), so maybe that accounts for the increase in sales rank and percentage. Another change is the product's description page is very thorough and attractive, much more so than earlier. This month, Jim Lyons, a 20-year veteran of the printing and imaging industry, returns to the topic of document formats. He takes a second look at what is happening with XPS and reflects on what recent litigation between Adobe and Microsoft tells us about how these two industry giants see the future of document workflows. In the United States, the hot months of July and August bring the annual tradition of taking some time off from the daily grind—kicking back and reading a few trashy novels while relaxing at the beach, in the mountains, or around the pool. This summer, I have been doing my best to conform to that tradition, but rather than reading pulp fiction, I have found similar enjoyment in reflecting back on the thrilling “file-format wars” of the past few years that lead right up to the present and that promise to spice up the future of our industry. In my April 2006 column titled “Microsoft’s XPS—After All These Years, More Mumbo Jumbo?” I looked into the current industry dust storm surrounding Microsoft’s XPS document-format standard—promised as part of its new Vista Windows operating system and Office 2007 productivity suite—and its potential threat to topple the present incumbent standard, Adobe’s PDF. The title of the column referred to my recollections of some of the messy battles between Microsoft and Adobe during the late 1980s and these battles’ parallels to those of today. Little did I know back in April that the 2006 battles had only just begun! In early June, the Wall Street Journal and other news organizations reported that Adobe had filed suit against Microsoft in Europe, seeking to block some of Microsoft’s actions after secret behind-the-scenes negotiations had broken down. Based on the history between these two firms, none of this should come as a surprise, but like all good tales, there’s a twist. The legal action, it was reported, was filed to block the new Microsoft software’s inclusion not of XPS but of PDF capabilities! Yes, indeed, the ability to read and write PDF files directly from the new version of Microsoft Office seems to be the subject of the dispute. PDF-translation features have been noticeably absent from Microsoft Office until now (but are available through third-party add-ins), although they are commonly included as part of distant-also-ran office applications such as the WordPerfect suite. Adobe, in what I maintain is a case of displacement behavior, is seeking to block a very customer-friendly and PDF-supporting move, most likely because of the firm’s anxiety about Microsoft’s PDF-alternative, XPS. Well, all that was early June, and since then I’ve been carefully watching the news wires. While there have been minor Vista and Office announcements, speculation about further relatively small schedule slippages, and European Union actions against Microsoft for other, older infractions, nothing more has come out about the PDF-related legal actions. So maybe the Adobe/Microsoft secret negotiations have reconvened? Or maybe, just maybe, the respective Adobe and Microsoft executives are taking the summer off reading trashy books at the beach? One of the primary wisdoms of my business career is the importance of learning magnitudes—that is, the general, if not exact, sizes of things such as markets. What is a large installed base? 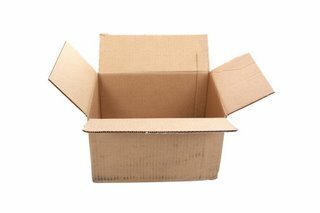 When is a market’s annual unit shipments sufficient to make a company take notice? This is just a long-winded setup for me to apologize for passing along the 20 million number in April. I should have known better. If I had just stopped to think about it, there are probably at least 20 million PDF files that have been created just for rebate forms, and, speaking of rebate forms, next month’s column will explore that topic. I covered some reported security issues with HP's printer management software in my May Observations. Now Computerworld reports some similar-sounding concerns, this time around Xerox MFPs. The news comes from The Black Hat Conference, held this week in Las Vegas. Brendan O'Connor, the "finder" of the problem (there might be a better descriptor of the type of people that "find" these problems), has some very interesting things to say about printers, MFPs, and copiers on our corporate LANs -- a familiar-sounding good news/bad news assessment that we in the industry have heard before. "Think of all the sensitive data that's going through these," he said. "Everybody prints, and there's an inherent trust in these types of devices." O'Connor said he was not trying to "pick on Xerox," but rather using his hack as a case study to draw attention to the security threat posed by increasingly powerful embedded devices. "I don't think they're getting the level of scrutiny that they require," said O'Connor, who identified himself only as a security engineer who works at a U.S. financial services company. The dog days of summer are continuing to be enlivened by some interesting financial results and announcements coming from some of our industry's leading companies. Kodak (NYSE EK) announced another quarterly loss, this one larger than Wall Street expected, and saw their stock drop below $20, which is a 25-year low! Ouch. Losses in the quarter were accentuated by higher materials costs in the traditional film side of the business. And another reason for the stock's decline was attributed to their reduced outlook for digital camera sales growth, due to their efforts to steer clear of sales increases at the expense of profitability in this rapidly saturating market. On the other hand, Adobe Systems (NASDAQ ADBE) led the entire tech sector to gains in Wednesday's markets, as they affirmed guidance for a strong third quarter. The company crowed about upcoming releases of Acrobat and Creative Suite -- interesting that one of the news items on their announcement referred to Adobe as being known for "the ubiquitous Acrobat program for sharing digital documents". We can see why there is some nervousness over the impending XPS functionality in Microsoft Windows and Office! By the way, with EK below $20 a share, the company's market cap is between $5 and $6 Billion. And with ADBE back about $32 (a big improvement over the $26 of a couple of weeks ago but well below its range in the low $40's earlier this year), their market cap is just under $20 Billion. While I was out, Lexmark (NYSE LXK) and Xerox (NYSE XRX) reported their quarterly results. Both companies, at least by rather narrow definitions, "beat the Street" in reporting numbers a better than analysts' expectations. Each of the quarterly summaries contained some interesting tidbits, with both companies reflecting current changes in the printing and imaging industry. Xerox revenue from color products and services grew 14 percent in the quarter, and now represent 34 percent of the company's revenue. Installations of the company's high-end production color machines grew 96 percent, Xerox said. Color now represents 9 percent of pages printed on Xerox equipment, leaving plenty of room for additional growth, Mulcahy said. Interesting ratio: 34 percent of revenue on 9 percent of the pages. A key factor was Lexmark's decision to place less emphasis on low-end, single-function inkjet printers earmarked for consumers at retail, since that product line had a low and declining margin. Also fueling Lexmark's earnings in the quarter was continued growth in its laser printer and all-in-one device businesses. Lexmark reported sluggish OEM sales of printers and multifunction devices to other vendors. Dell has been Lexmark's largest OEM customer and last week warned Wall Street that its earnings wouldn't meet earlier guidance. Interesting moves: shedding sales of low-end, single function printers (presumably intentionally) and OEM business (not quite as clear on intention). One of my management truisms learned over the years has to do planning for and enjoying vacations. Of course, we all, at least most of us, enjoy a week off. But one learns early on, too, that it's quite nice when the boss takes a week or two of vacation. Not that anything nefarious is going to happen, no cheating, stealing, or whatever, but just the little bit of freedom with the boss out can be a very enjoyable and pleasant change. However, after a few years, when one's career has advanced to include people management, we change. Yes, having the boss out can still be a minor joy, but more often than not, the real break is when those "reports" take some time off, for the same reasons as the old days -- a little more freedom, a time to work on some things that haven't been addressed for awhile, even a little more time to breathe! So that's my management truism, or put another way -- "you know you're in management when you look forward more to your employees' vacations than your own!" 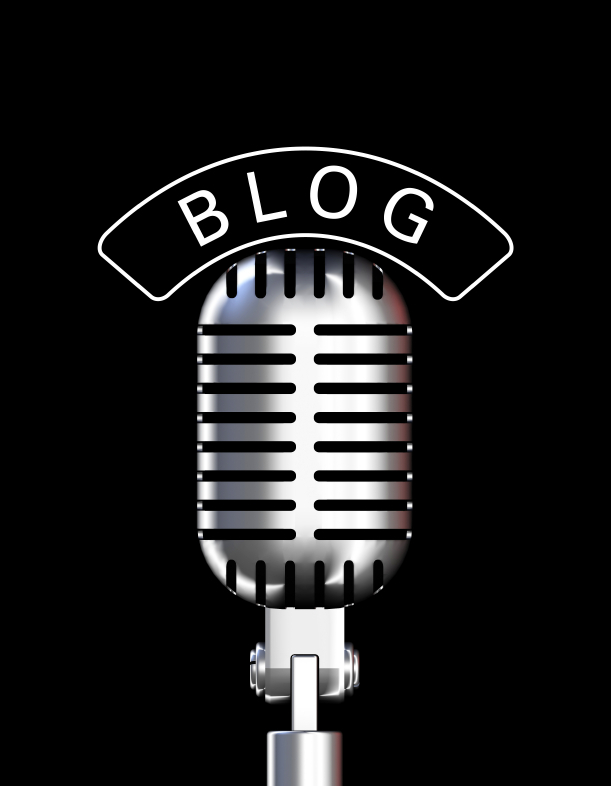 In this day and age, taking a week off from the blog is something too. Got to think about that! 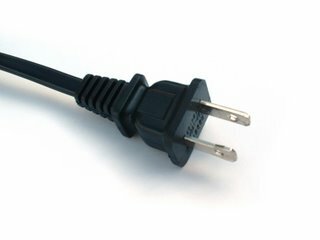 Dell Disappoints, AND "Pulls The Plug"? In what's getting to be a more familiar story all the time, Dell (NASDAQ DELL) has once again rattled Wall Street with an earnings forecast disappointment. Mid-morning, their stock is down below $20 (a 14% plunge, almost matching Yahoo's dive earlier in the week), with others, including HP (NYSE HPQ) down in sympathetic moves. At the same time a Consumer Reports piece entitled "Dell to pull plug on confusing deals" offers a summary of Dell's recent announcement to simply their end-user pricing, including eliminating rebates and offers like "free" printers. Is there a connection? In another choppy day for the stock markets, Lexmark (NYSE LXK) is down about 5% with an hour and a half left to go in the trading day. While searching (to no avail) for news that might help explain this drop, I found an interesting news release from June 29th that sailed by up until now. Maybe proving that the Thursday before a four-day holiday weekend, mid-summer to boot, isn't exactly a great time to get a press release noticed? Anyway, the subject promotes the Lexmark Web Toolbar I wrote about in my June Observations, with some interesting (if a bit overly cute) observations of their own from a recent survey covering web printing. Inkjet Printers -- Part of the "Hidden Economy"? Boston Globe writer Christoper Shea writes about something a pair of economists call the "hidden economy". Their study combines printers with cell phones, car rentals, and hotels as products and services that are often less than straightforward in their pricing, with unwitting consumers ending up paying much more than they're led to believe up front. Their example of the printer buyer: "...how many people realize, when they walk out of CompUSA, a nice $99 inkjet model tucked under their arm, that it's likely they've just committed themselves to spending nearly $1,500 on ink cartridges over the next four years?" Their advice? The first part is one I also subscribe to: "...your best bet is to be a sophisticate..." when it comes to understanding your total cost of ownership. The next part engenders a little less enthusiasm from me: "Print in draft mode, don't gratuitously print things that you don't need, and when in doubt, print at work. Those simple pieces of advice will save you about $500 a year." For one, printing at the workplace is a good idea, if it's for work! And $500 a year? Savings? 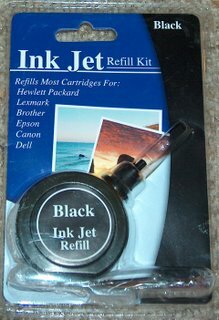 That's a ton of ink! will continue to benefit from rapid cost cutting combined with more benign pricing activity due to the strategic shift toward higher-priced, higher-usage devices and slower year-over-year sales of low-end inkjets. This month, Jim Lyons, a 20-year veteran of the printing and imaging industry, shares his thoughts on the razor-and-blades business model that has defined the printing and imaging industry for decades. Is this model still viable, and what are vendors doing to adapt for survival? A May 2006 headline in a financial blog that I follow really struck a nerve. 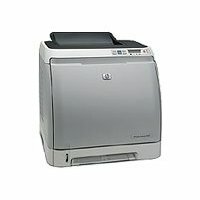 Entitled “Lexmark’s and HP’s Printer Business Model Is Increasingly Unsustainable (LXK, HPQ),” the blog, which was published on SeekingAlpha.com, noted that Staples is promoting the Samsung CLP-510 color laser printer for just $199 (after a $50 mail-in rebate, of course). In a well-thought-out but still somewhat pessimistic analysis, the blogger claimed that the laser printer market is following the same path as the ink jet printer market—the street price of a new laser printer (including its toner cartridges) is now low enough to disrupt consumers’ virtually automatic, steady, years-long purchase of supplies to replenish their printer “investment.” Instead, the blogger insisted, consumers will frequently start over and purchase new hardware rather than a set of new cartridges. Let me try to add some historical perspective to this “the sky is falling” scenario. 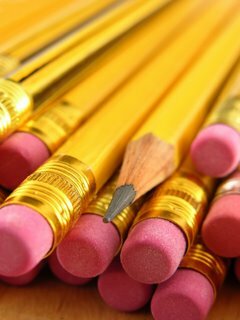 For many years now, printer makers have used a marketing practice known as the “razor-and-blades” approach to pricing products and attaining profitability. The idea is to “lock in” a customer with a relatively costly initial investment in a product (safety razor or printer) and then sell a stream of supplies (blades or printer cartridges) to that customer over time. Because the “lock in” is key to the follow-on annuity, the supplier is motivated to make the customer the proverbial offer one cannot refuse for the initial purchase, and then be less generous in pricing the supplies from which the vendor realizes an annuity stream. A unique technological “match” between the original product and the follow-on is obviously important, but there is also an important relationship between the pricing of the more costly hardware and the less costly, but more frequently purchased, supplies. With that price ratio rapidly diminishing over time, there is the potential that the razor-and-blades models will be disrupted and that a growing number of consumers will choose to purchase a new printer or MFP rather than purchase supplies for their old model. Lyra’s John Mc Intyre, whom I consider to be the ultimate industry expert on this topic, points out that while the dramatic price declines (and concurrent volume explosion) in the low-end color laser printer market are raising this debate now, the ink jet printer market faced the same issue a few years ago with the first sub-$100 and then sub-$50 printers. One of the industry’s ongoing adaptations with ink jet printer pricing has been to resist the downward price pressure, partly by adding more value to their hardware, with the ink jet MFP and photo-specialty categories being obvious examples. Look no further than HP’s June product rollout (featured on page 1 of this issue). Although the rollout included a Deskjet printer for $39, the least-expensive product touted in the firm’s press release is a more feature-rich $129 Officejet MFP. There is, however, a market element that the “doom-and-gloom” set who point to the imminent demise of the printer industry’s business model of choice ignore: there are different types of printer buyers. Personally, I am the type of consumer that printer vendors are worried about—I thrive on technology; am well-informed about printers, supplies, and their costs; and tend to seek out the best deals. Thus, I am more likely to follow the “start over again” path and purchase a new printer rather than just the new supplies for my old printer. But, as John Mc Intyre points out, many (or even most) consumers may be sensitive to the intangible “switching costs” associated with purchasing a new printer, such a setting up a new device and getting it to work smoothly with your PC when your old printer is working just fine. 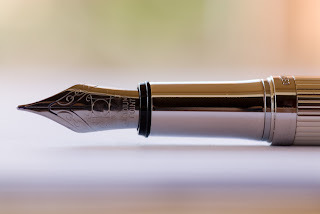 These consumers might decide to “leave well enough alone.” Many end users may simply not mind paying $100 or less for a set of new cartridges every once in a while (these are most likely the same people who ignore their mail-in rebates). In addressing this topic, I realize I’m opening a huge can of worms, and that’s without even tackling the huge complication of aftermarket supplies. Collectively, the OEMs, the channel, and third-party supplies vendors study and fret over the hardware/supplies pricing/profitability issue more than any other, as perusal of this or any other recent issue of The Hard Copy Observer or The Hard Copy Supplies Journal will show. And Wall Street and the rest of the financial community have been focused on the whole relationship between hardware and supplies since long before the consumables portion of a printer vendor’s income statement became the dominant line item. In fact, this whole discussion is so central to the entire printing and imaging industry, I risk not being able to reach any big conclusions in this small space, but I’ll leave you with a couple of small ones. First, don’t assume that all your customers will behave the same way that a relatively few geeky, technology-obsessive customers will. I will jump at the chance to replace an older piece of technology such as a printer or MFP with a new one, especially if I can rationalize it as a cost-neutral decision. Mainstream end users and businesses are probably much safer bets in terms of continuing their steady buying patterns, and one might argue they know how to spend their time more productively as well. Second, adapt! Nothing ever stays the same, and those that don’t realize this truth are doomed. Twenty years ago, when HP was getting ready to roll out a new product, I heard some internal moaning over the fact that we were endangering what had become a lucrative “blade” business. The new product was the LaserJet Plus, which featured “soft font” capability and offered customers an alternative to buying the “blades”—in this case, $300 font cartridges. Offering a choice and better bang-for-the-buck was the right thing to do for the customer, and the record shows that HP found ways to continue to grow a profitable business nonetheless. 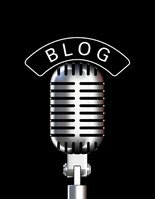 Ed Crowley, CEO of Photizo Group, blogs about printer industry profitability, and has an expanded analysis at OnDemandJournal.com. Market Data on the cheap? The End of the Rebate (as we know it)? OfficeMax is one-upping their Office Superstore competitors by ending the mail-in rebate (or MIR). A story from CNET details their action, citing customer dissatisfaction as their motivation. It will be interesting to see if they can match all those good "after-rebate" deals by simply reducing in-store prices, as one of the economic "secrets" of rebates is the fact that many of those eligible never get around to doing all the work to receive the rebate and then cash the inevitably late-arriving check. And the big potential loser? The state and local governments that with MIR's receive sales tax on the full, pre-rebate price.